Cow Canyon is a site in the Canyon Pintado National Historic District south of the town of Rangely, Colorado. 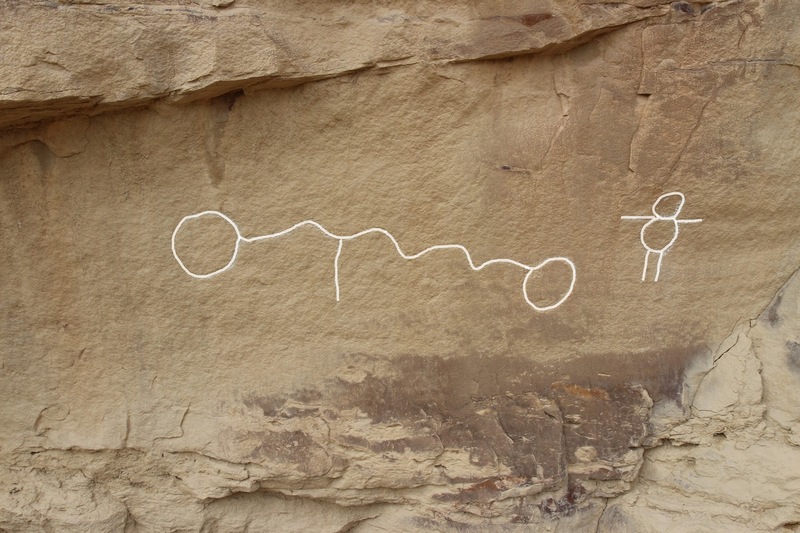 The location contains both historic and prehistoric petroglyphs and pictographs. 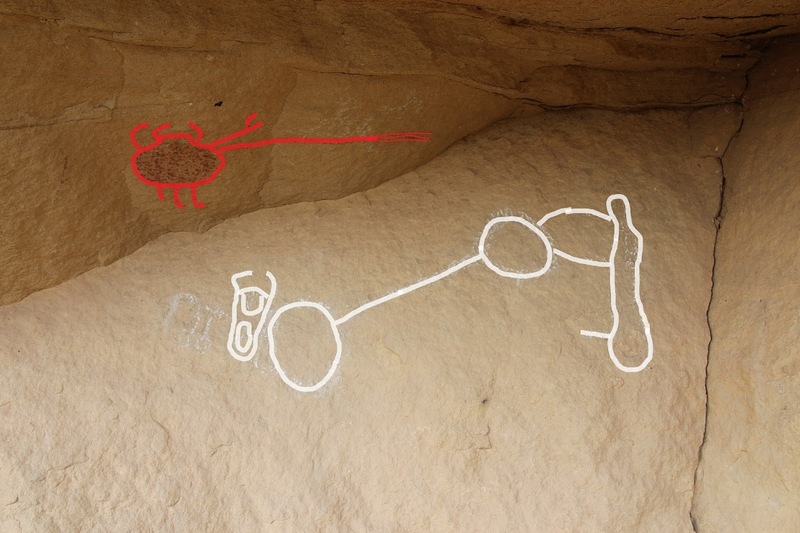 It is possible that the site contains the shields and the two fighting men petroglyphs seen by Padres Dominguez and Escalante for which the area was named. 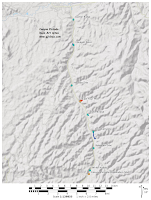 The trailhead is located along Highway 139 near mile marker 57 about 14 miles from its junction with Highway 64 on the eastern outskirts of the town of Rangely. The trailhead is about 1 mile from the highway. After turning off the pavement watch for another sign within less than a quarter mile. Turn right off of the Philadelphia Creek road and continue for 8 tenths of a mile to the trailhead. The road is graveled and stands up pretty well to a little rain. The BLM has built a viewing platform at the trailhead from which to see some of the petroglyphs. A kiosk provides details about the potential significance of a few of the images at this site. Many of the petroglyphs at the Cow Canyon site are of good quality. Here is a panel that is protected somewhat by an overhang. The red image is a pictograph. 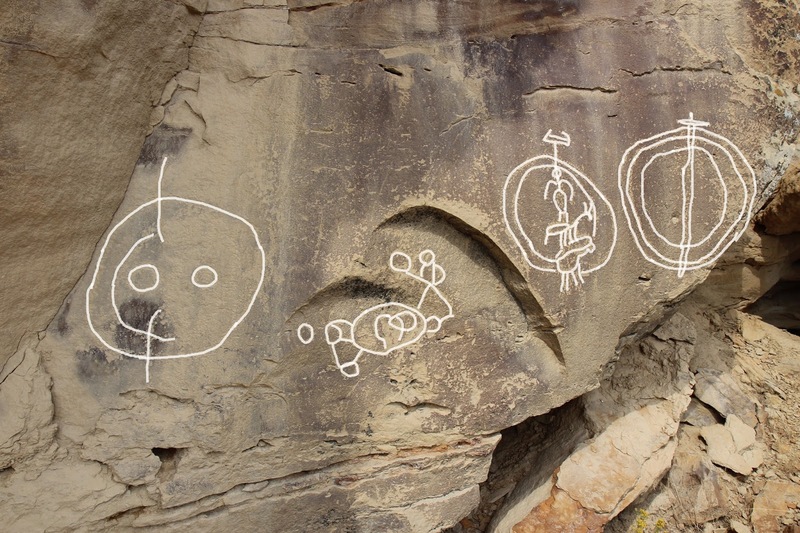 The images that we outlined in white are petroglyphs that look like someone had rubbed chalk of something else on. Making chalk outlines is illegal and as you can see here, if you visit the site, it can be very damaging. Often times two circles connected by a line were used to represent two men talking. The images next to each circle may have been symbols that would have identified each man. The image on the far right in this panel is a Spanish flintlock pistol that would have been made during historic Ute times. Even though we outlined the image on the computer the original image is still easy to see. This panel of images are the really intriguing ones at Cow Canyon. 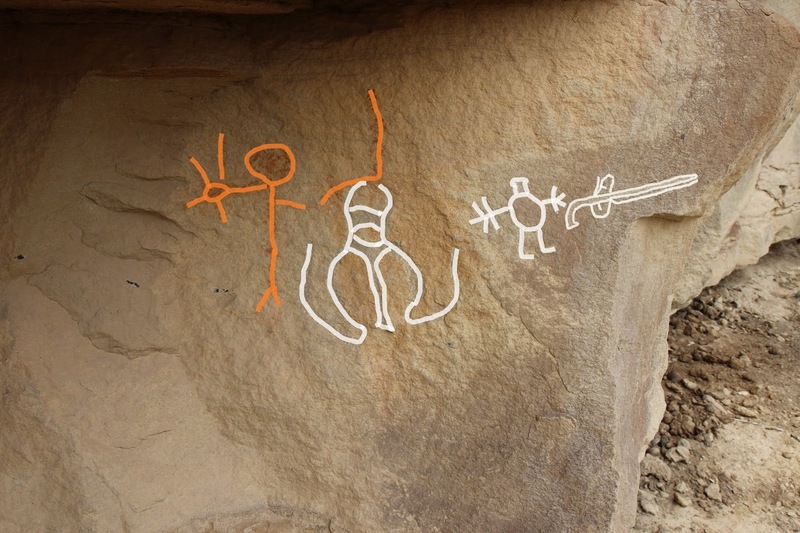 The speculation made on the kiosk is whether these images might be those seen and recorded by Father Escalante in his journal where he mentioned three shields and the rudimentary images of two men fighting. When the Dominguez-Escalante expedition passed through this area in 1776 they were being led by an Ute guide that they had met near what is now known as the Grand Mesa. Their Ute guide would have led them past this spot and undoubtedly interpreted the images for them. They were making every effort to avoid Apaches that they knew to be in the area and they mentioned that at least one of the images was an Apache shield. Could it be that the two men fighting were an Apache and an Ute? The other thing that you have to wonder about is whether the image of the Spanish flintlock was inspired by one being carried by someone on the Dominguez and Escalante expedition. 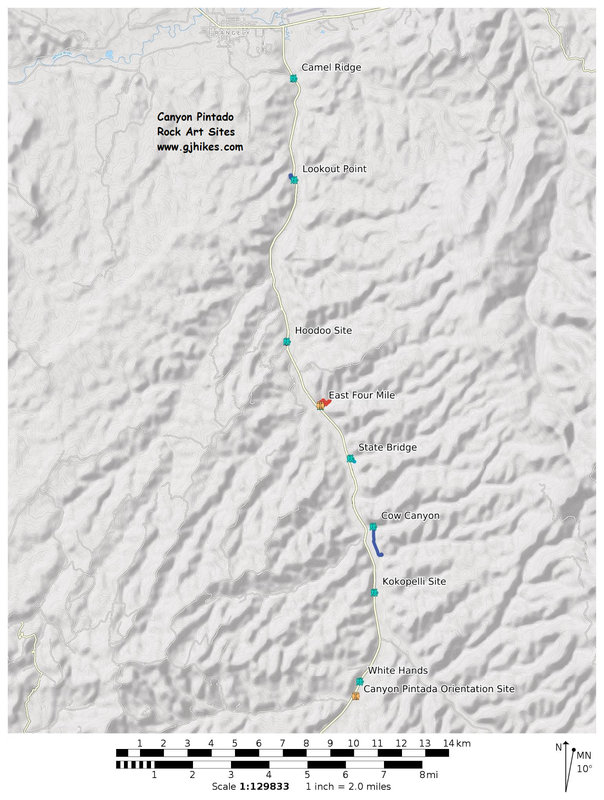 If that is the case and if this is the location of the actual Canyon Pintado panel then Cow Canyon could be a site of the utmost historical significance. When you take the panels in order from left to right it could tell a story of two men, or groups, talking followed by crooked talk or one group not telling the truth or doing what they said they would do which ultimately culminated in a fight. All a lot of speculation on our part but fun nevertheless. If you would like to see it for yourself then all you have to do is 'Take a hike'.